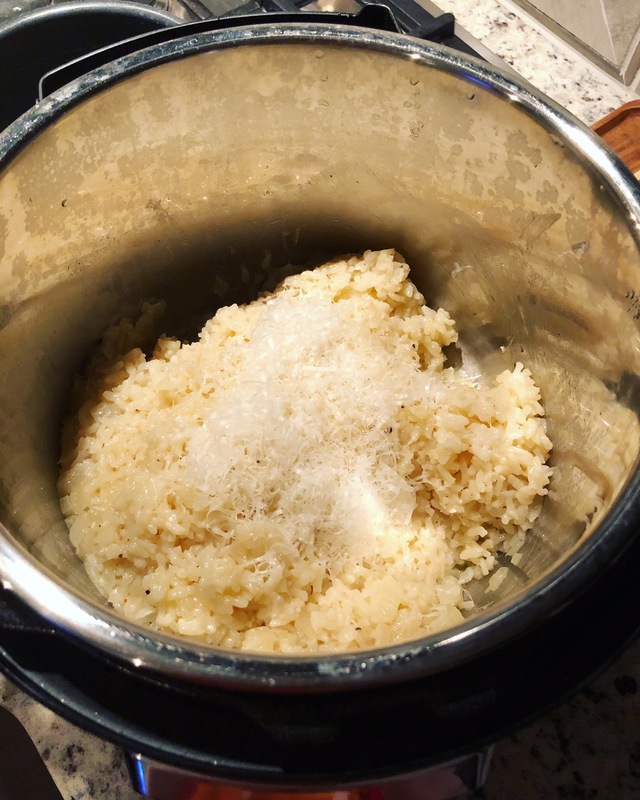 So I have an embarrassing secret which is that I have been serving boxed lundberg risotto from Sprouts for a long time now… Just because this instant pot risotto is super good and easy does not mean I am going to stop using the boxes though. I am not going to lie. It’s super clutch in the summer when you grill all your meat and veggies and need a starch side that requires no effort or ingredients. Ahhh summer. 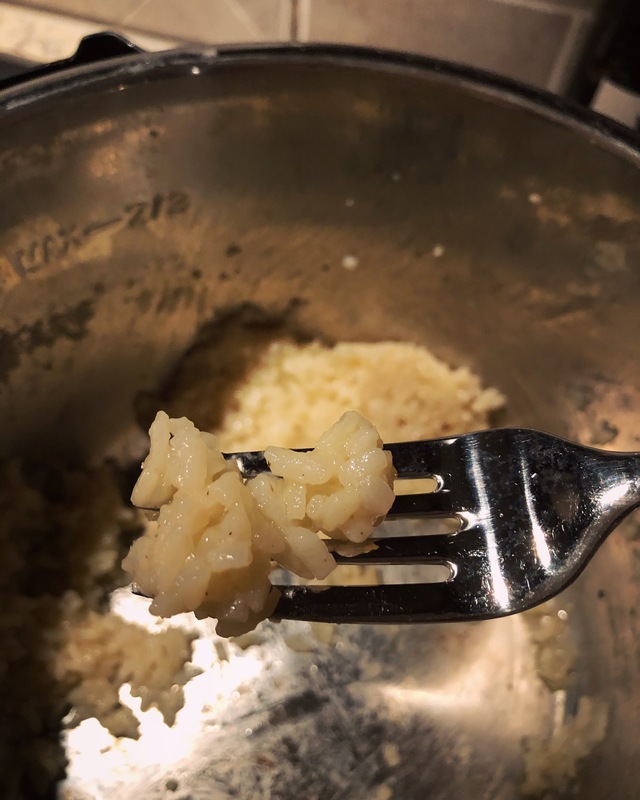 Risotto is a weird dish. It is so comforting in the winter and can be dressed up with parmesan, mushrooms, bacon, poached eggs, beef. But it also screams summer – lemon, garlic, peas, shrimp, lobster. It is extremely versatile and can be indulgent. The problem with risotto is always the detailed steps described in my cook books “add 1 cup of stock at a time and stir stir stir.” Who has time for that? Well here is a nice solution with the help of my new favorite kitchen tool, the instant pot. This dish can be intimidating but the instant pot makes it approachable and easy for weak night cooking or a last minute side. This recipe is almost as easy as making a box of lundberg parmesan risotto. But it is significantly more delicious. Risotto is rich, creamy, buttery. This risotto is just a classic with seafood (grilled lobster tails in the summer!) and champagne. Sauvignon blanc is also perfect. If it’s winter and you’re having risotto brinner – bacon, poached eggs – merlot is a wonderful pairing. Mushrooms? Go for an earthy pinot noir. I am pining for summer so I plan on serving my leftover risotto with some grilled chicken thighs. They are in a garlicky tuscan marinade in the fridge and I am going to finish them with a squeeze of lemon tomorrow. If you want to make bacon and egg risotto. Just start with a quarter pound of chopped up bacon when you saute your onions. Poach or fry your eggs while the instant pot releases pressure. Set the Instant Pot to saute on low and add the butter and EVOO. Saute the onion until it is transluscent, ~5 minutes. Stir in the garlic and rice, cook for 1 minute until the garlic is fragrant. Pour in the white wine, cook until it is absorbed. Add in 1 cup of the chicken stock and stir constantly, cooking until all the broth is absorbed. Pour in the rest of the chicken stock, salt, pepper, and 1 quarter of the parmesan cheese. Press the manual button and set the time for 10 minutes. When the time is up allow the pressure to release naturally for 10 minutes. Then press the button for quick release (please please please study the manual for instructions on how to do this, I cover the whole top with a towel to contain the steam a bit). When the float valve drops, open the lid. Mix in the rest of the Parmesan cheese. Taste the risotto and season with salt as needed.